Alamu disclosed this in Osogbo while briefing journalists on the forth-coming convocation ceremony. He explained that the total of 3,164 students from six faculties, for the 2013/2014, and 2014/2015 academic sessions would be convocated. According to him, while 27 students bagged a first class honour for the 2013/2014 session, 24 students had first class in the 2014/2015 academic session, making a total of 51 first class students. “the citadel in its tradition of excellence in teaching and character modelling had been able to produce intellectuals that were making wave all over the world. We remained focused, and committed to full implementation and evaluation of the University 2012-2016 Strategic plan. 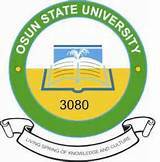 “Since the last convocation ceremony in 2014, Osun State University has continued to make progress in teaching, research, community service, physical and infrastructural development. The 2014/2015 academic session witnessed the resuscitation of Entrepreneurial Training for the final year students, in line with the mission of the university. “I am delighted to inform you that most of the graduands will be collecting two certificates by the end of this ceremony- Bachelor’s degree certificate and the Entrepreneurship skill set certificate,” Alamu added.